Nonetheless, I hemmed and hawed for days over Batman: The Telltale Series . Finally, inevitably, I dove in to my first Telltale game. If you’re a comics or Bat-fan, but the choose-your-own-adventure nature of this new Batman video game is throwing you for a loop, this review is for you! First and foremost, if you’re a fan of the Batman Arkham series, Telltale’s approach to gaming is the literal opposite. 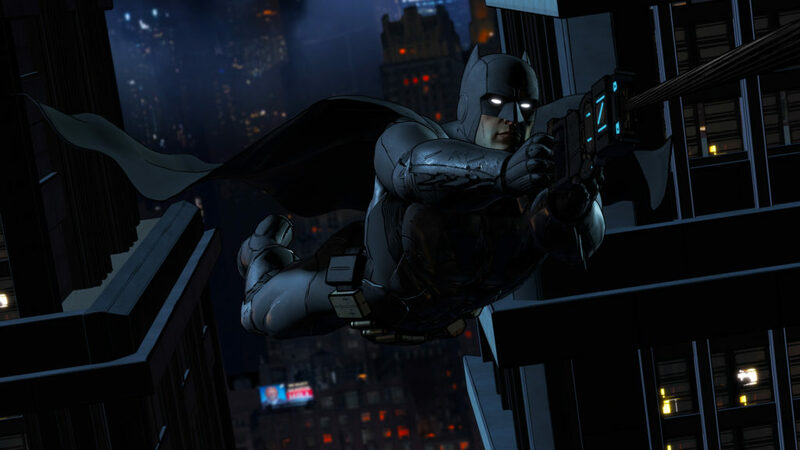 Whereas Arkham is heavily focused on Rocksteady’s intuitive, free flow combat system, Batman: The Telltale Series is all about the choices you make as both Batman, and primarily as Bruce Wayne. Fighting as Batman is the worst part of the game; the surprise thrill comes from making hard decisions affecting Gotham’s future in the heat of the moment. Batman: The Telltale Series is interactive storytelling, in which you influence the story. Your actions and words as Bruce Wayne influence people around you, such as Harvey Dent, Carmine Falcone, Alfred and Catwoman. Essentially, you live an animated Batman movie trying to define Batman as you’d like to see him. I debated for a good long while whether this approach to a Batman game was a way I wanted to invest my time. If you’re looking for action and adventure, this is definitely not the video game for you. Check out those Arkham Bundles on the newest consoles, and move right along. Batman Telltale really tries your patience with this element, too. The game opens with a combat heavy scene, and while it gets you accustomed to the game mechanics, they are the least interesting components of the series. Combat is a series of matching buttons (an X flashes on screen for Playstation… you push x… repeat…), and swiping the control stick. I’ve found this approach tolerable in other games (Lord of the Rings: Shadow of Mordor comes to mind), but when it’s all there is, it really grates. Due to the strength of the story and influence of your decision-making, though, I’m easily ready to recommend the game. If you love Batman, enjoyed a brief foray into motion comics like Astonishing X-Men: Gifted, and are always down for a new Batman story with unique alterations to the Bat legend, Batman: The Telltale Series is a surprisingly good time. Sure, I’d just as soon pick up some Batman comics, but actually playing through Gotham with strong writers and storytelling is a enjoyable change of pace. 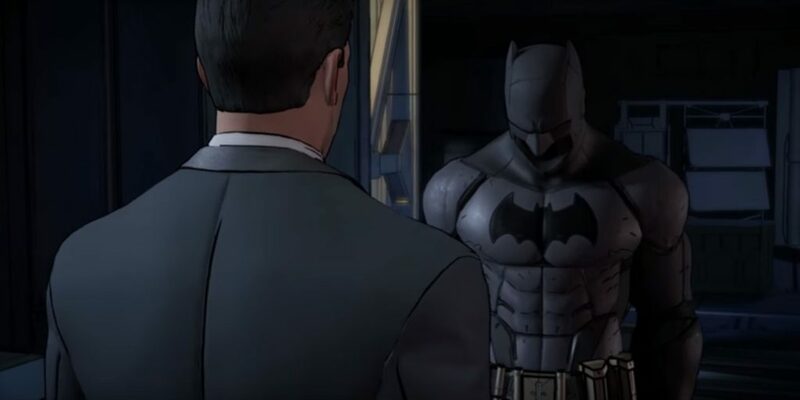 Batman: The Telltale Series is broken into 5 episodes, further solidifying the interactive animated series aesthetic. Episode 1 is titled “Realm of Shadows” and establishes Telltale’s take on Batman: Year One , or Batman Begins . We’re early in the Caped Crusader’s career, although he has been operating on a scale already known to Gotham and the likes of Lieutenant Gordan. It’s unclear through “Realm of Shadows” what Batman’s rogue’s gallery might look like, but we learn that Arkham Asylum is well established, and meet Catwoman for the first time during the first adventure. One of Bruce Wayne’s dialogue options is to hope that Catwoman is merely a tourist in Gotham, slyly funny given the history we know the two will share. The core plot of “Realm of Shadows” follows Bruce Wayne’s attempts to influence Gotham politics, namely the election of Harvey Dent as mayor. Stamping out Gotham’s corruption as a concerned (and immensely wealthy and influential) citizen ultimately leads Bruce into “alleged” crime lord Carmine Falcone and reporter Vicki Vale. The beauty of the Telltale mechanics is that it’s nearly impossible to complain about Batman acting out of character – you define him as you wish him to be! Telltale’s biggest twist on the established Batman mythos comes in the form of Oswald Cobblepot, aka The Penguin, here known as Bruce’s dear old friend “Oz.” While connecting Bruce and Oz as childhood friends is a significant departure from The Penguin we know, it makes a surprising amount of sense. Cobblepot has always been tied to elements of Old Gotham, even in his most bizarre turns behind the likes of Time Burton and Danny Devito. Rather than shoehorn in their own “Gates of Gotham ,” Telltale uses Cobblepot to represent the deep history at the center of both Gotham and the narrative. Admittedly, as a veteran reader of Year One, Batman: The Long Halloween , and that stinking overused origin story, I was initially weary of another take on Batman’s early days. Telltale does a nice job, though, of concentrating on rarely explored political elements of life as a Wayne. Most importantly, “Realm of Shadows” crafts a compelling mystery that has me absolutely locked in to complete the series. I already find myself wishing Batman: The Telltale Series would expand deeper into Batman’s career, applying similar elements of decision making to the likes of the Joker and Ra’s Al Ghul. With four episodes left, I don’t expect any such time jumps, but time will tell. For now, at the $25 price point for a season pass, I’d recommend the game to Batman fans everywhere. Great to read a review from someone who’s never delved into Telltale before. I personally love what they’re doing as I enjoy stories, and although many will point you in the direction of The Walking Dead, I’d sooner recommend their adaptation of Fables, The Wolf Among Us. The game is fantastic and nails that world completely and utterly. That said, the action scenes in these games are definitely not a strong point and they’d probably be just as well leaving them out entirely and letting Batman be more of a detective game than trying to shoehorn in some QTE fighting. I’ll probably delve into this once all the episodes are out and binge the whole thing. I actually downloaded the wolf among us years ago on a rec, then never played it. Ive read (and loved) Fables since then, and now I’m itching to check it out.